JAMES Milner’s fault? Virgil van Dijk’s fault? Alisson’s fault? Whomever was to blame for Fulham’s equaliser against Liverpool on Sunday, they owe me, and presumably all of you, for the years that goal took off us… For seven minutes at least. Tongue out of cheek, all three played their part in calming The Reds down and eventually firing them back to the top of the Premier League. Manchester City have a game in hand but it is Liverpool’s name at the summit for the next two weeks, which could be an important mental advantage in this title race. The importance of the three points at Craven Cottage cannot be underestimated. Some believe that City are unlikely to drop any more points this season, but to believe that they would drop points in two games, while a Liverpool side that failed to beat Fulham would win its remaining games, would seem a tad fanciful. However, Jürgen Klopp’s men didn’t fail. They succeeded despite being far from their best and got the job done in a way that, dare I say, champions do. It’s funny how Liverpool’s lack of perceived ruthlessness and electricity led some in the wider football world to suggest it was a fortunate win, or that it was a sign that they struggled to juggle Champions League and Premier League football in the same week. Many of us had of course hoped that the confidence that would be coursing through the veins of the Redmen after their 3-1 win in the Allianz Arena against Bayern Munich last Wednesday would lead to a sound thrashing of Scott Parker’s Cottagers. That didn’t turn out to be the case, although with some better finishing and Milner getting a better connection on his clearance, it could have been. What made the underwhelmed reaction to the victory particularly funny was that it was far from the first time Liverpool have played supposedly poorly and won this season. Reasons for that have varied from Mo Salah being off form, to missing Phil Coutinho, or even that some teams have “figured them out”. After 31 league games, Klopp’s men sit top on 76 points. More than they achieved in 38 games last season, as many as they achieved the season prior to that, and 16 points more than the season before that when Leicester won the league. In fact, Liverpool already have five points more than the final total of the team that finished second that year. The many who are itching for Liverpool to fail have been grasping at the luck card again. Tim Cahill and Leon Osman appeared on Sky and the BBC respectively saying that the game-winning penalty shouldn’t have been given. More realistic critics pointed to the fortune that Sergio Rico would make such a huge error to gift the opportunity in the first place. As the old saying goes, you make your own luck… Wnless you’re Liverpool in which case you’re jammy and get everything your own way and life’s not fair and it’s all a conspiracy and some day the devil is going to come for your soul and you’ll be relegated to the Hell and District Counties League Division 2. Sarcasm aside (the highest form of wit I’m led to believe), moments of fortune can play a part, but across a season you generally finish where you deserve to. No reasonable person can argue that Liverpool don’t deserve to be in this title race with Manchester City, even if there have been some wins that have needed to be ground out along the way. 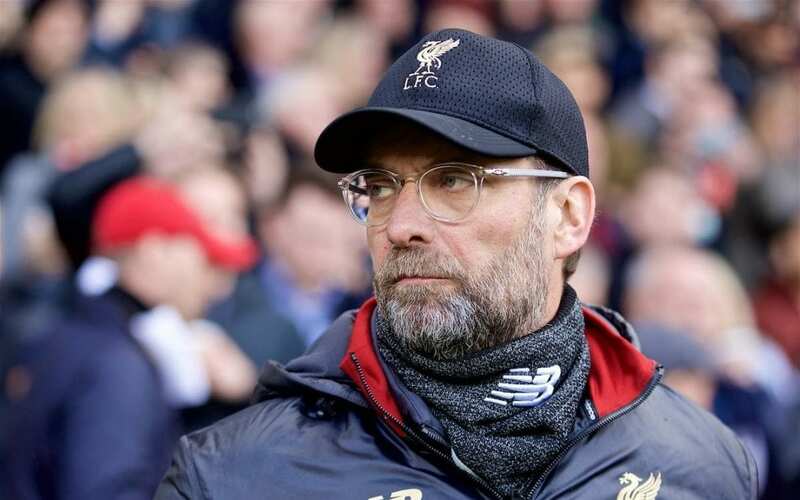 Simultaneous gulps of terror could therefore be heard when Klopp addressed what he felt was the real reason for the slight lack of cohesion in Sunday’s performance, and some others throughout the campaign. The bespectacled German told Sky Sports after the game: “I am not in any doubt about my players’ nerves. It is about intensity. We go for perfection but it is rare that you get it. People will say we need to be more convincing, but we are at the start of a development, not the end. He believes that this Liverpool team is merely just getting started. He knows they can play better and to their highest level more often. At the same time, despite inconsistencies, this version of Liverpool is on course to achieve the second best points total in Premier League history (unless City finish above them, in which case it will be third). Klopp believes further development is possible. Of course, he believed the same at Borussia Dortmund and was ultimately thwarted by the might of Bayern Munich’s spending. The same could happen this time round with City, but this time he has had sufficient money of his own to strengthen his hand, and with all due respect to his Dortmund team, now has better tools to work with. 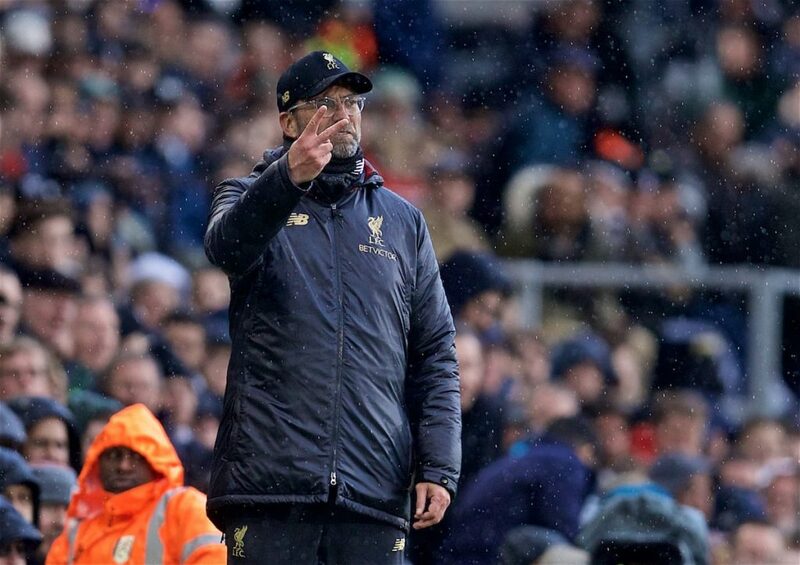 It may concern those who love a good transfer window to have heard Klopp’s recent comments about not needing to splash the cash again this summer, but it is because he has such faith in the squad he has already put together and knows that this team developing together is what will make them stronger. He will sign some new players, if only to replace the outgoing ones, but the heavy investment has already been done to get the spine in order. Anything else is likely to be finishing touches to what will hopefully be a masterpiece. Every key player is signed up long term to the club, and youngsters with their whole careers ahead of them are given opportunities to become a part of it. Trent Alexander-Arnold and Joe Gomez have already take their chances, while Rhian Brewster is likely to get his next season. This current Liverpool team is capable of so much. Who knows? It might even achieve a historic double in the next couple of months. And yet, as Klopp says, there is still plenty of room to grow. Rivals are likely to grow as well, but at the moment nobody is matching the rate of development that The Reds are showing. The scope for achieving higher is getting smaller the more points Liverpool accrue (you can’t lose many fewer than one league game). However, if in the future they can put in convincing performances more regularly, generally win games more comfortably and continue to develop a widespread fear and respect throughout football, then the building blocks could be in place for something sensational that could go on for years to come. 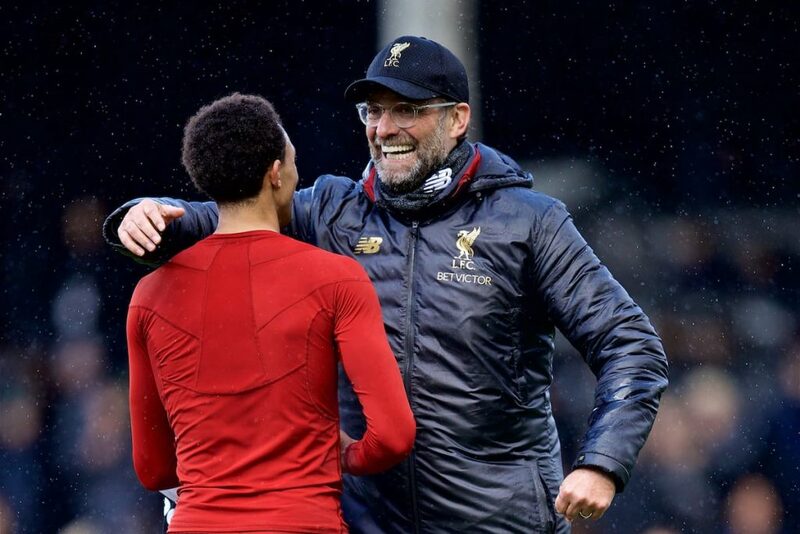 Alexander-Arnold also commented on the development of this team after Sunday, citing the three games won last week, and suggested that previous teams would have crumbled under some of the pressure. “Maybe a few years ago we might have won one of those games. Especially against Fulham, maybe a few years ago we would not have got the three points, but we’ve showed how good a team we’re becoming. There is plenty to be excited about with this current Liverpool side, but its evolution is even more tantalising as far as I’m concerned. Mostly because once they improve to the point of regularly winning games like Fulham 3-0 instead of 2-1, I can stop having mild coronary issues every time I watch these Reds do their thing. The many who are itching for Liverpool to fail have been grasping at the luck card again. Tim Cahill and Leon Osman appeared on Sky and the BBC respectively saying that the game-winning penalty shouldn’t have been given. A part of me (not the part that watched the game) is quite content we got a “jammy” win. If it had been Citeh (and it has been), I write off the 4-0’s and the 5-1’s. They don’t bother me. It’s the last minute winners that really gall me. Perfect, I will happily take a slew of 2-1’s against Southampton, Barcodes, Huddersfield etc … as long as we keep winning. 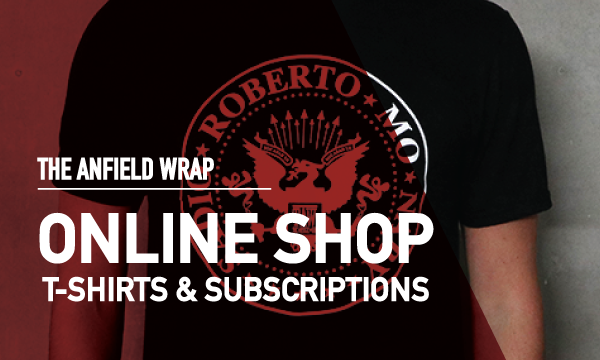 That’s this season and it’s live !! As for the future, if Klopp thinks there is more to come then brilliant. It’s been a great ride since he came. Massive occasions, dramatic games, finals reached and now we are establishing ourselves as genuine league title challengers. I am loving it. The thing was though Greg is it wasn’t a jammy win. We dominated and created chances. If anything we were unlucky it wasn’t more and we completely gifted them their chance, with a series of 3 wrong choices/executions that we could not contrive to do even if we set out to do them. As mentioned, the pen is and was a pen. However we had a stonewall pen turned down before Fulham’s goal that was nailed on, as the Fulham player was all over Gini as he was about to nod into an open goal. Parson waved play on, as he had done for a number of incidents on Liverpool players. So when they committed another holding/drag back offence, then it had to be awarded.